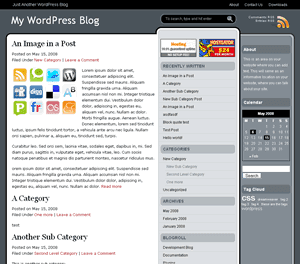 WP Blogger Themes Wordpress themes for Blogger. Free Blogger themes and templates for download. Description: UltimateBlogger is a very versatile widget-ready design that accomodates AdSense and paid ads well. Hi, love this theme really great work!! I don’t suppose anyone can help me, I'm trying to replace the ‘Entries RSS’ link at the top right with my feedburner url but I'm having trouble, I have found where I'm guessing the URL needs to be entered after “Data:”? but it wont work, any suggestions of where/what I should be entering? need help...how to insert header banner on this template? Nice one! Thanks for this template. very perfect but cud u pls add menus on the top below the blog title like as that of fusion?? It's such a great template! I'm trying to remove the quick icons which appear under each post. How can I remove them? Excellent theme! but I'm having one small problem. Any time comments are disabled the left and right columns break and are shown below the content section leaving the two columns blank. Any idea how to fix this? thx!